Crew Sergeant/Squad Leader) + .30 M1 Rifle. Pvt/Assistant Gunner + .45 Pistol. 2 x Pvts/Loaders + .45 Pistols. 2 x Pvts/Drivers + .30 M1 Rifles (Towing Vehicles). Muzzle Velocity AP 853 m/s. Maximum Rate of Fire 15 r.p.m. 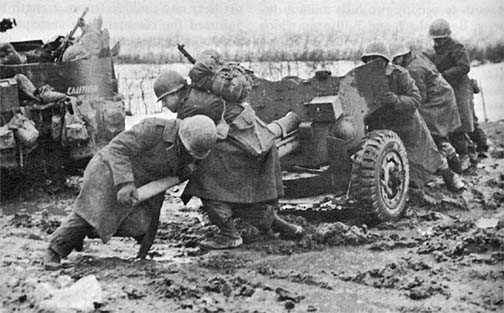 Notes In 1941 the US army had decided to build their own version of the British designed 6 pdr, this was to supply the British with a lend lease weapon to equip there anti-tank regiments. By this time their own 37mm M3 was found wanting, so the army took an interest adopting the 57mm. With various modifications including a new carriage, the version adopted by the US army was the M1A3 which was light enough to be towed by a 1 ½ Ton truck. In May 1943 the 57mm M1A3 started to replace the 37mm M3 as the standard Anti-Tank Gun but it would be another year until it finally took over. The M1A3 served on all fronts until 1945.